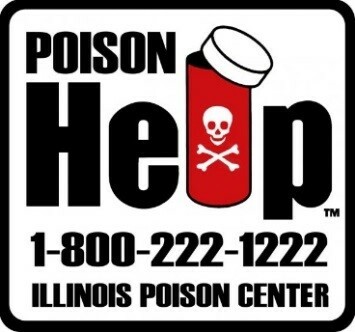 March is Illinois Poison Prevention month! More than a million American children younger than 6 years old suffer from poisoning every year. Children are very curious and often explore the world with their mouths- it’s a normal part of their development. The most common products that children ingest include household cleaners, personal care products, and over-the-counter medications. Vitamin pills, especially containing iron, and Aspirin are typically safe for adults, but can cause serious reactions in a child’s body. Keep detergents and other hazardous cleaning products out of reach of children or securely locked in a cabinet that your child cannot open. Keep all products in their original containers to avoid confusion. If ingested, these products can cause serious burns to your child’s mouth, feeding and breathing tubes. If you suspect poisoning, some signs can include vomiting, an unexplained odor from their mouth or on their clothes, or a burn on their skin. Before attempting any at home remedies, please call Poison Control right away. If your child has any trouble breathing or has passed out call 911! Having a Party? Make sure to keep alcohol in a locked cabinet, and empty and rinse any containers immediately after gatherings to prevent alcohol ingestion by your child.